Yves Klein From Wikipedia, the free encyclopedia. Yves Klein (28 April 1928 - 6 June 1962) was a French artist. Klein was born in Nice. Both his parents were painters. He lived in Japan for a time, becoming an expert in judo, before settling in Paris and beginning to exhibit his work there. Many of these early paintings were monochrome and in a variety of colours. By the late 1950s, Klein's monochrome works were almost exclusively in a deep blue hue which he eventually patented as International Klein Blue (IKB). As well as conventionally made paintings, in a number of works Klein had naked female models covered in blue paint dragged across or laid upon canvases to make the image, using the models as brushes. Sometimes the creation of these paintings was turned into a kind of performance art - an event in 1960, for example, had an audience dressed in formal evening wear watching the models go about their task while an instrumental ensemble played Klein's The Monotone Symphony, which consisted of a single sustained note. Klein also made sculptures in deep blue, and worked with fire, creating some sculptures using it, and setting fire to some of his canvases, thus making scorched holes in them. Klein is also well known for a photograph, Saut dans le Vide (Leap into the Void), which apparently shows him jumping off a wall, arms outstretched, towards the pavement. Klein is considered an important figure in post-war European neo-dadaism. He engaged in such provocations as "publishing" a chapbook containing only empty pages and selling empty spaces in exchange for gold which he then threw into the river Seine. 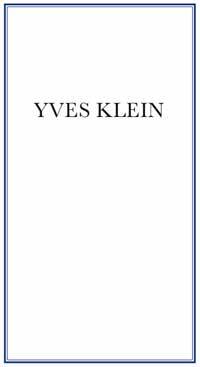 Klein died in Paris of a heart attack.